According to a new report from a Japanese Apple blog, Apple’s AirPower wireless charging mat will finally be released next month. And according to earlier reports from multiple sources last year, it’s going to cost $200 when it’s released. Being able to wirelessly charge three different devices at once is cool and all, but is it really worth $200!? We think it’s worth about $36, and that’s exactly what you’ll pay for the Y-king Qi Wireless Charging Triple Pad thanks to a discount on Amazon. Grab one now and you’ll be triple-charging to your heart’s content long before Apple finally gets around to releasing its pricey wireless charger. Samsung Galaxy Note 8, S8, S8 Plus, S7, S7 Edge, S6, S6 Edge, Nokia 9, Huawei Mate 10, Nexus 4, 5, Lumia 920 and other Qi-Enabled devices. 3 x wireless charger areas, 2 x USB ports! ENJOY THE FREEDOM ONLY A QI WIRELESS CHARGER HAS TO OFFER! No more messy cables and insertions; simply put your phone on the qi wireless phone charger, and the job is done! 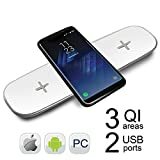 Since your satisfaction is our top priority, this qi wireless charging station is backed by our 60 DAYS FULL MONEY BACK, 18 Months FREE REPLACEMENTS GUARANTEE.